Women love shoes! The number of pairs we have may be a lot more than the number that we actually need. Are you an admitted shoe-aholic? Let’s be honest here: Women love shoes. Oh, there are rare exceptions of course — those unusual women insist that anything over five pairs is unnecessary and a waste of money. A recent poll said that on average, women own 17 pairs. And that number is down from four years ago when most women admitted to owning 19 pairs. That number seems low, but maybe the pollsters aren’t counting our slippers and flip-flops! The number of shoes most of us own is probably higher, but just how many pairs do you really need? Call it a sneaker or a running shoe, but it’s good to have a washable shoe that gives great support when you exercise and work out, or just for casual running around with the kids. Serious runners will dispute that one pair is adequate, but most of us can get by. In a neutral colour — black, brown or tan — this is a go-to shoe that transitions from the office to nightime and is a blessed relief from high heels! Good with pants, skirts, jeans or shorts. A pair of simple ballet flats is a no-brainer. Dress up for evening and you’ll need a mid-height heel: It elongates your legs and makes you look taller, and is the finishing touch for more formal occasions. If you have only one pair, black is the most versatile choice. The classic pump is for the office, too. It adds authority to a suit, snazzes up jeans and a blouse and somehow makes us feel more powerful. Unless you live in a tropical climate, boots are a must in winter. Stylish knee-highs in leather are terrific, but if stuck with the rule of one pair opt for a flat sole with anti-skid protection and a warm, fleecy lining. They may not be as runway-ready as the trendy fashion boot, but function is the key in cold, icy climates. Comfy sandals for summer can go on long walks, to the beach, or to town and work with shorts, skirts, capris and pants. Nobody wants to wear hot shoes in the summer, but we can’t always go barefoot. A nice pair of leather sandals is certainly more versatile than a rubber flip-flop. But we like those, too! At least five pairs will get you through your days and nights, but where’s the fun in that? Most women will want variations on these basics in several colours and it’s hard to resist the siren song of a shoe sale! 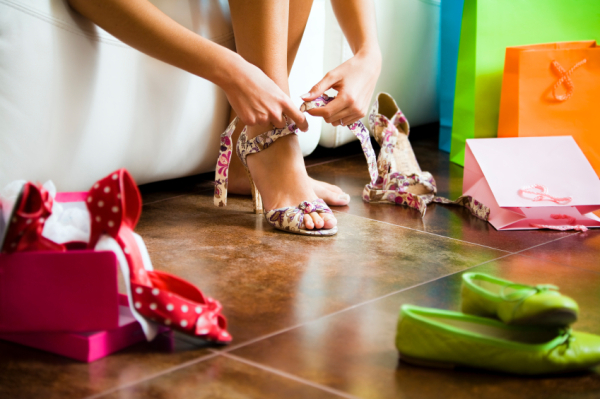 Shoes are simply a pleasure to buy — maybe because, when it comes to shoes, it doesn’t matter if we’ve gained a few pounds. Shoes will still fit and make us feel happy, stylish and feminine! Are shoes being given the boot?! What’s in for fall!